Calculate birth dates and age for you, baby, your entire family, friends too! Birthday Calculator - From birth day of week, to when future birthdays occur, chart your birthdays, baby's, anyone's! Age Calculator - Check age down to the second, now or at any point in time! Baby's First 24 Months Calculator - Easily see when your baby reaches early age milestones. Calendar Generator - Create monthly calendars, personalized with daily age, photo, more. Yearly calendars too. Baby and Me Growth Calculator - watch your family grow! Premature Baby Corrected Age Calculator (at MyMonthlyCycles.com) - Calculates chronological and adjusted ages for preterm babies. Age and Fertility Calculator (at bInfy.com) - Enter your age, calculates your fertility status. Half Birthday Calculator - Calculate half birthday for anyone. Birth Date and Name Code Generator - Get unique codes based on your special dates and names. 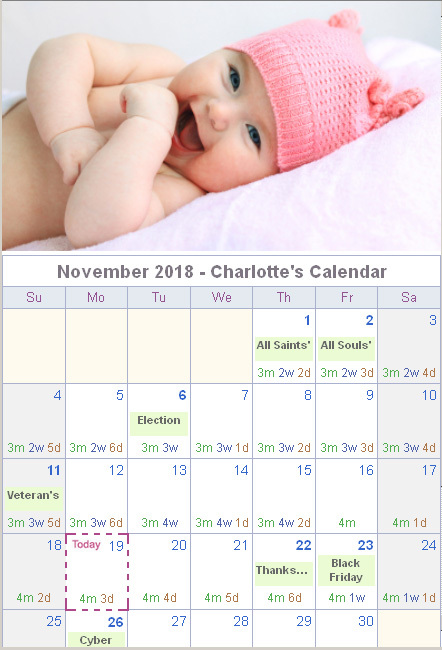 Age Milestone Calendar (at bInfy.com) - For parents and grandparents. Couples Aging Calculator (at bInfy.com) - View your growing old together chart. WhenMyBaby's Holiday Calendar! - Countdown to upcoming holidays & more! Apgar Score Calculator - Helps calculate baby's apgar score 1 and 5 minutes after birth. Family Age Clock - Generate today's age chart plus fast forward! Baby's Firsts - When do babies first crawl, sit up, giggle...? Add your baby's milestones too!